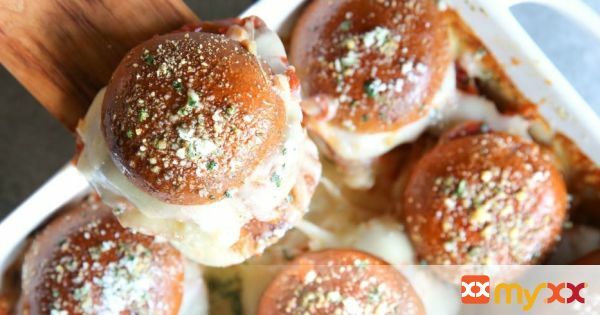 The crust vs bun battle is on with these sausage pizza sliders. 1. Preheat oven 350°. Spray baking dish with olive oil spray and place bottom slider buns inside. 2. Spray a large skillet with olive oil spray. Heat over medium-high and brown sausage evenly until cooked through, about 5 minutes. Transfer to cutting board and rest for a few minutes before slicing into 1/4-inch diagonal pieces. 3. Place an even layer of mozzarella over buns, layer with sausage slices and a spoonful of marinara. Cover with an even layer of mozzarella and place slider tops on top. Brush with melted butter and top with sprinkle of parsley and Parmesan. Cover with foil and bake 10 minutes, then remove foil and bake until cheese is melted and tops are lightly golden, about 5 minutes. 4. Sprinkle with additional parsley and Parmesan. Serve warm.